Close to a year after retiring from international cricket, former Indian captain Sourav Ganguly has said he may play for Bengal in the upcoming Ranji Trophy season. The 37-year-old pointed out that he was open to the idea of playing "a few of the four-day Ranji Trophy matches" if the Bengal selectors were keen on including him in the team. "At the moment I haven't spoken to anybody, but I'll definitely be speaking to the selectors, and if I'm required, then I won't mind playing a few matches," Ganguly told the Telegraph, the Kolkata-based daily. "The 2009-10 season is again a very crucial one for Bengal and we're in a tough group. So, if I'm required, I'll be there." It was reported earlier that Ganguly would be playing for Bengal only in the Vijay Hazare Trophy to gain some match practice before turning out for Kolkata Knight Riders in the third edition of the IPL in March-April next year. However, he said he was keen on playing the home games during the Ranji season and the knock-out matches later, if Bengal qualified. "I cannot sit out 11 months in a year and hope to fire in the IPL," Ganguly told the Times of India. "It may be Twenty20 cricket, but let's not forget that it's a top-class international tournament and the standard of cricket is very high. I need to get into the groove before IPL 3 starts in March 2010." Ganguly played 113 Tests and 311 ODIs and scored 7212 and 11363 runs respectively at an average of 40-plus. He also featured in 242 first-class matches, and is 67 short of reaching 15000 runs. With Bengal taking on heavyweights like Uttar Pradesh, Saurashtra, Karnakata, Maharashtra, Baroda and Delhi in Group B of the Ranji Trophy Super League this season, Ganguly's experience is expected to bolster Bengal's fragile middle order. Bengal are also set to welcome back ICL players like Deep Dasgupta, Abhishek Jhunjhunwala and Rohan Gavaskar. 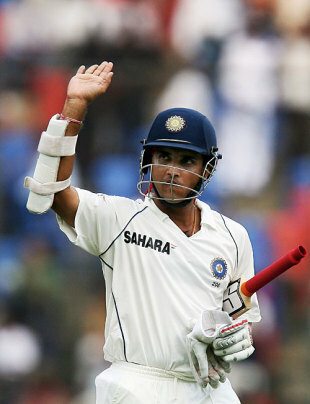 Bengal captain Laxmi Ratan Shukla and selector Devang Gandhi were both delighted with Ganguly's decision. "Dadi making a comeback is big news. It will be great for Bengal and a huge plus for Bengal cricket. It will be of great advantage if he turns out this season," Shukla told the Telegraph. "With the world of experience Sourav's presence brings to the team, it will definitely help Bengal cricket," Gandhi said. However, the Cricket Association of Bengal (CAB) said it was not yet aware of the development. "He hasn't told us anything," said CAB joint-secretary Biswarup Dey. "It won't be fair to make a comment based on media statements." Ganguly, who is also the chairman of CAB's new cricket development committee, said the decision was unlikely to interfere with his administrative responsibilities. "Not at all. I will do what I can as a member of the CAB working and cricket committees," Ganguly said. "Balancing the two won't be a problem. And like always, I will give it my best shot."